Living a debt-free life is a thing that everyone wants. At least, I would not like to see my debt is eating up my hard-earned monthly income. To lead a debt-free life, you need to have a solid plan. How would be your solid plan? 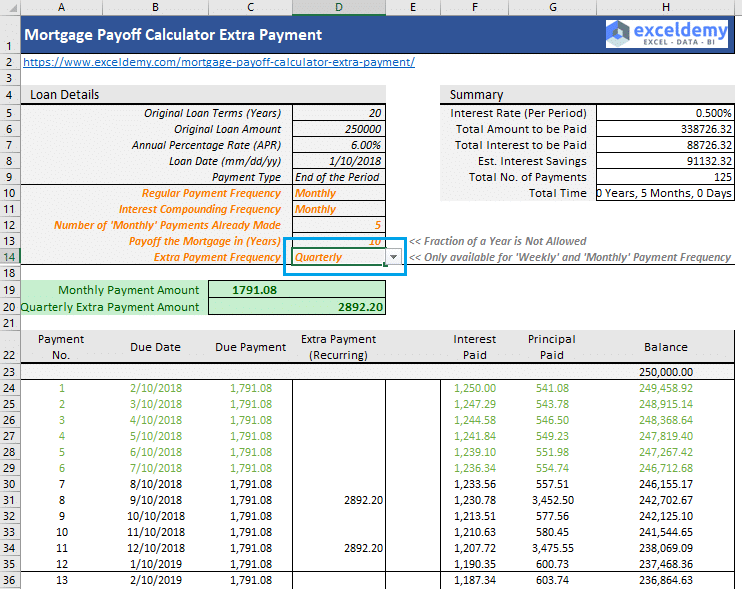 Using my Mortgage Payoff Calculator Extra Payment, you can easily find out how much extra payment you have to pay every month (or at any interval) with your regular payment to pay off the loan early. Let me show you how to use both the calculators with a number of examples. How Much Extra Should You Pay to Pay off your Mortgage Early? 1) Is there any prepayment penalty practiced by your lenders? 2) Any high paying CREDIT Card or Any Loan You’re Paying? 3) Have you saved enough in your emergency fund? 4) Is your mortgage loan ruling your life? Blake had taken a home loan of amount 250,000 on Jan 10, 2018. He has made already 5 payments. His original loan term was 20 years. Annual Percentage Rate is 6%. For the last 6 months, he has tracked down all his expenditures and found a way to extra pay $2000 a month with the regular payment of his mortgage loan. Now he is planning to see how much he has to pay extra if he wants to pay off his loan in the next 10 years (rather than 20 years). So, the result is: Blake has to pay $954.10 extra every month if Blake wants to pay the loan in the next 10 years rather than the 20 years (his original loan terms). 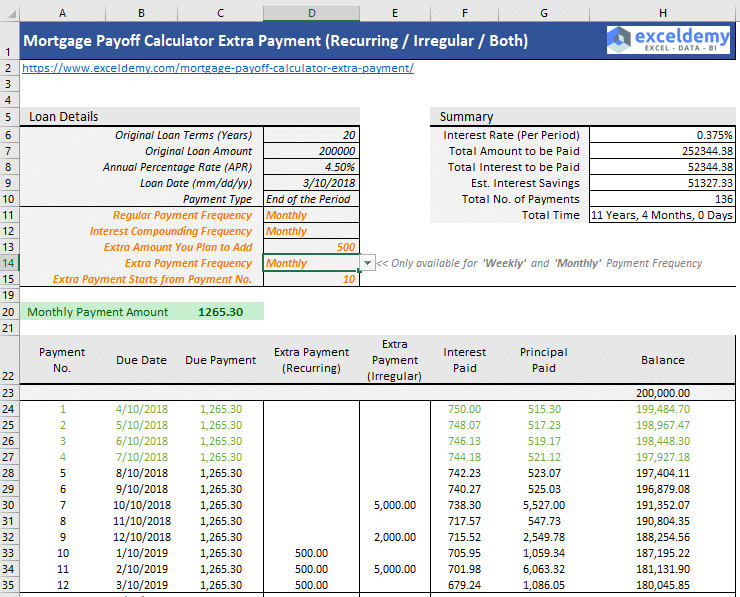 On the right side of the worksheet, you will find the summary of the loan like Total Amount to be Paid, Total Interest to be Paid, Est. Interest Savings, Total Time, etc. What if Blake wants to pay the extra payment quarterly, not monthly? Simple. Just change the Extra Payment Frequency from Monthly to Quarterly. Blake finds that after every 3 months, he has to pay 2892.20 extra to pay off the loan in the next 10 years. Fallon has taken a mortgage loan of an amount for her newly bought home. Original Loan Terms (Years): 20 years. Loan Date: March 10, 2018. A recurring extra payment: She plans to pay 500$ extra after every month. But it can be also bi-monthly, quarterly, and yearly. And an irregular extra payment: When she would have some extra amount to pay, she wants to pay to her lenders. Extra Irregular Payment: Don’t know the date but she can add it in any loan period. This is her loan summary now. In the above image, you see that she can add any amount of extra payment to her regular monthly and regular extra (recurring one) payment. And she will be able to repay her loan completely in 11 years, 4 months, and 0 days. My Excel calculators have some more options that will make your life easier. These options make these calculators more versatile when compared with the other calculators available online. Interest Compounding Frequency: In some countries, payments are due monthly but interest might compound in other periods. For example, in Canada, mortgage loan payment is monthly, but the interest rate is compounded semi-annually. Interest Compounding Frequency has options like weekly, bi-weekly, semi-monthly, monthly, bi-monthly, quarterly, semi-annually, and yearly. But the caution is: if your payment is monthly, interest compounding frequency cannot be less than monthly, I mean if the Interest Compounding Frequency is weekly or bi-weekly but regular payment is monthly, on the right side you will see a warning. 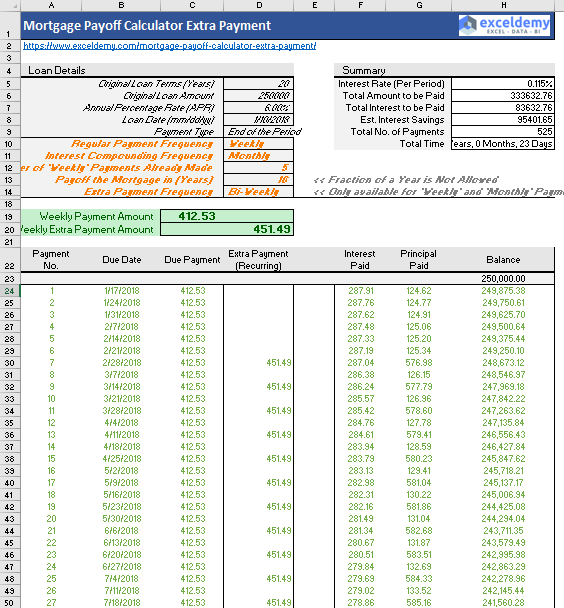 Payment Type: You can also use a different payment type for your calculations. For some loans, Payment Type can be at the beginning of the period. In most cases, payment is done at the end of the period. Whatever it is: there are two values for your use. Total Time: In the loan summary part, you will be able to find the real Years, Months and Days to pay off all the loan with your activities. Interest Savings: Est. Interest Savings is a good measurement of how much you are saving with your prepayments. There are some factors you should consider before you are going to prepay your mortgage. Some lenders might have some penalties for prepayments. Consult with the lenders or check out the terms and conditions that you had accepted when you took the loans. If there is any penalty, consult with your lenders to find a solution to this situation. If you have any high paying CREDIT card or Car Loan you’re continuing with, it is better to pay them at first. Say, you’re are paying a 12% (APR) CREDIT card loan for an amount of $10,000. Your monthly interest charge will be $100. In your sense, it is not a big amount to bother. But in reality, if it would be your Mortgage Loan, you would have to pay only $50 (only interest). So, if you pay your CREDIT card loan at first, you’re actually saving $50/month, that is actually 600$/year. You know emergency happens. Save enough amount at your emergency fund. Then plan to prepay your mortgage loan. For someone, bearing a loan for year after year is really bothering. Sometimes, the person might find himself in a place where he might feel that the loan is actually controlling himself. In this situation, try to vanish the loan from your life. Carrying a loan for 20-30 years, it is about one-fourth or one-third of your total lifespan. So, when you are in a situation to prepay your loan, get rid of the loan in the shortest possible time. 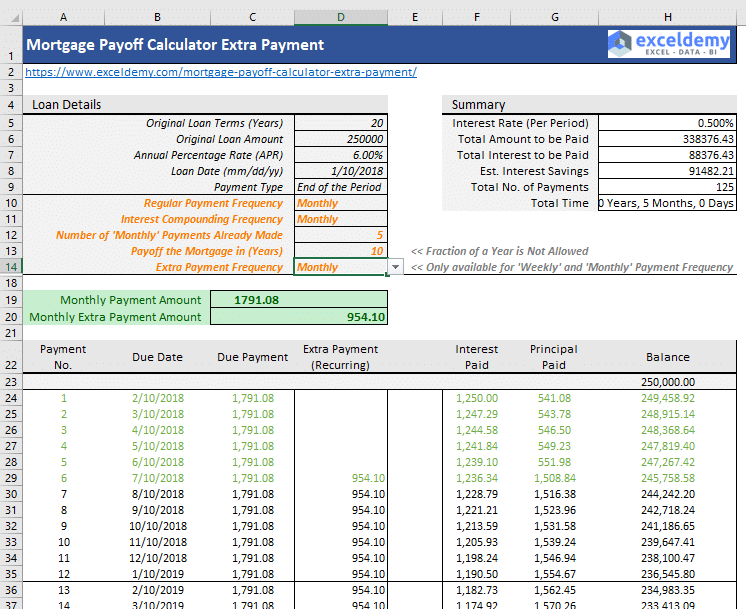 In my workbook, you will find a worksheet (named Prepayment Checklist) where you can check out the factors. If all the factors are green, you can attempt to pre-pay your loan. You will save a lot of money as interest savings if you can prepay your home loan. This will make your life more flexible and enjoying. Some people might come with a logic that interest spend is tax deductible. But my question is how much? For example, you pay $1000 interest on the home loan. So, you’re saving 250$ (assuming tax rate is 25%) every month. But the rest $750 is going to the lender and it is a spent. So, if you pay early, you can save that $750 every month. And there are other schemes where you can save money and that money is tax deductible. Your saved money will able you to save money for your retirement or you can set up your own business. Owning a business can give you more financial freedom if you can become successful in business. Though the pitfalls are not many prepayment decision comes with some. At one point of life, you might need a good amount of cash to start a business or for some major emergencies. Money in the checking account is easily accessible than to get money by refinancing your home. Consider this before start paying off your mortgage loan early. From the above discussion, I think it is clear to us that paying off your loan early is a major decision to take. Think about all the factors that we talked about. Principal Amount: The original amount you took from a lender as the loan. Regular Monthly Payment: This is the amount you will pay every month. This includes the interest amount of the loan for a period (normally month) and a portion of your principal amount. Loan Terms: This is the total number of years you and lender have agreed upon to pay off all the interest and loan. For mortgage loan, it is normally 15-30 years. Annual Interest Rate (APR): Annual Interest Rate you will pay for your loan. Say, your home loan APR is 6%, then the interest rate for a month will be 6%/12 = 0.5%. Extra Payment: Extra payment you want to pay every month. After paying your monthly amount, whatever you pay is considered as extra payment. There are two types of Extra Payments: Regular Extra Payment and Irregular Extra Payment. It totally depends on your lenders how you can pay your extra amount. Interest Savings: If you make extra payments with your regular payments, you will save some interest. This is referred to as Interest Savings. Tax Deduction: Mortgage interest is tax deductible.